Following up from last weekend – my Norbertine Community Life lays claim for me to be home for the evening gathering – Mass at 4:30 (I preside & preach once a week), Evening Prayer, conversation and supper following - until about 6:30pm. appointments, as you need me. Also our Chapter Meetings (Community Days) periodically require my presence; preparing to elect our new abbot on April 4th, we will gather February 20th & March 20th from 8:30am until 8:00pm for prayer, discussion and discernment. Please keep us in your prayer – that the whole Community may be faithful, reconciled, renewed & zealous; and that we may choose wisely in God’s Will, a leader to draw us forward! Thank you! Then, a word about a particular Lenten practice. It’s so obvious, that it may sound ‘stupid’ to you. But I want to suggest that simple, quiet, solitary, gazing upon a crucifix can be a very rich, healing, stirring and beautiful Lenten devotion. Maybe you have a favorite one. 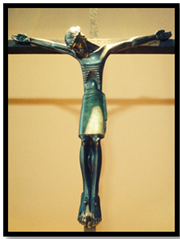 This bronze by Jean Lambert-Rucci from the 1950’s is one of the abbey’s most precious works of religious art, behind the tabernacle in the abbey church. Or maybe you want to “Google” the vast array of cultural, historical, artistic, spiritual variations by which this supreme sacrifice of Christ is depicted!? For the first 500 years after Christ, the Church couldn’t bring itself to consider the crucifix as art, or devotion; it would have been like hanging an oil painting of a convict in an electric chair in your dining room – too horrible, graphic, gruesome! As late as the 4th century, the Church used the image of the Good Shepherd to represent Jesus; but the Crucifix was kept out of religious art. Surprisingly though, to pray the Our Father/the Lord’s Prayer, early Christians ‘struck the posture’ of the Crucified Christ! That was something –especially under persecution until 313A.D. to which they could relate! More on that next week. “God does bless us...EVERY one”! Older PostResurrection Friday Lenten Fish Frys! **Holy Day Masses are at 8:05 AM and 6:30 PM. Please check the bulletin for details. Individual reconciliation/confession is available 3:15-3:45 PM Saturdays or anytime by appointment.